After I completed snowflake #2 I knew I wanted something a little larger, but I didn't want anything too labour intensive and I wondered what it would look like if I faced the cloverleaves inward instead of outward. That presented a problem. The previous snowflakes all had a single rings facing inward. I knew that once I had cloverleaves facing inward I was going to have a big empty space in the middle and there wasn't going to be anything holding the cloverleaves in place . The obvious answer was to attach them all to a central ring, but how big a ring did I need? Trial and error? I wouldn't know if I had it right until the whole motif was done. 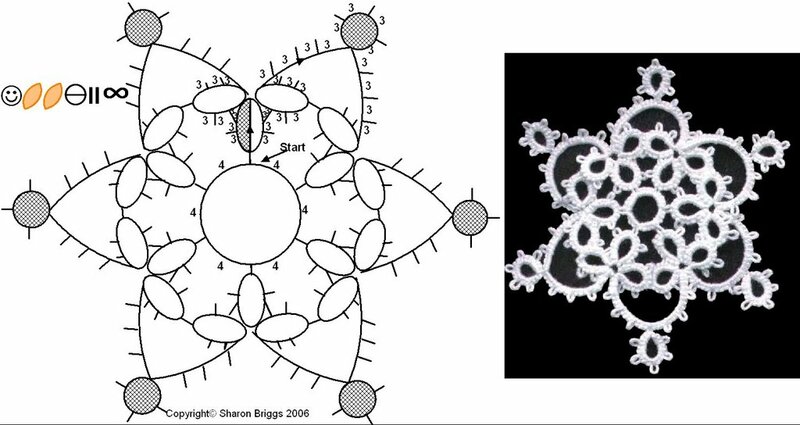 The motif with one ring inward and one outward took me about an hour to tat and with double the number of rings I could count on nearly 2 hours of tatting time just to find out how big that central ring needed to be. This is where I used another designer's trick. I worked from the outside in. I knew what the outside was going to be, I knew that the chains had to be long enough to arch over the cloverleaves so I used chains with 3 picots (3-3-3-3). When you're doing something in reverse you have to think ahead a little. Take a look at the diagram. Remember this is how the pattern should be written, not how I tatted it. I needed to be able to have all of the outside completed before doing the middle ring of the last cloverleaf. If I started at the cloverleaf, the last thing to be done would be the chain. In order to have the chain completed by the time I got to the last cloverleaf I had to start at the chain. When I got to the last cloverleaf I tatted the first ring with one shuttle the third ring with the second shuttle, then used both to make the central ring. That positioned both threads in the middle of the motif and then I just started tatting a ring and tightened up the stitches, like you do when you close a ring. When I was at the point where I could join to the picot on the tip of the next cloverleaf, I had my stitch count of 4. Then I just finished the ring off using making 4 ds between the joins to the central ring. When I closed the ring, the motif was done. This is a very simplistic version of working from the outside in. Take a look a Mark's post for September 28, 2006 and you can see that it's exactly what he's doing for the Geisha's sleeve. He's created a framework for the lace to give him a more precise way of establishing what he needs to do. I was viewing an embroidery blogs and noted that the blogger had created her own stitch library as a reference tool. On the e-mail list I mentioned that I have a bag full of scraps from things I have tatted that didn't work. In a sense they are my reference library. If I want to know how big a ring is going to be in a certain thread with a certain stitch count, I can just look for a sample that size. I can fit different pieces together like a jigsaw puzzle and see what is visually appealing. Don't consider a design that didn't come out the way you expected it, as a failure. You not only learned through the process what doesn't work, you've also gained another piece of reference material. 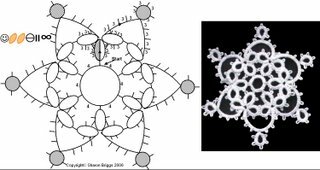 Now that you know the stitch count for the inner ring which is used in the remaining snowflakes, you have enough information to figure out the rest of them for yourself. As a way of stretching your abilities and your confidence, I'm not going to give you the rest of the snowflake patterns. You can do it without. Next we're going to look at what else you can do with a snowflake, but that's for another post. Where do we go from Snowflakes?